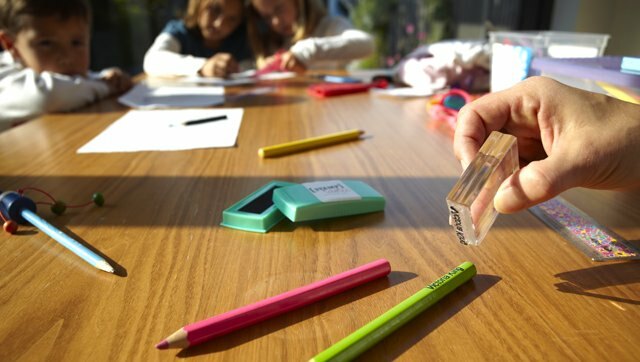 One of our friends and co-founder of Stamptastic, Francesca, has written us a fantastic piece on organisation -schools, accessories and kids. Something we can all relate to. My three lovely children were fully hatted, coated and uniformed not 7 days ago. Washed and ironed school clothes filled their wardrobes, hairbrushes were easily located on dressing tables, matching socks were balled and stuffed into drawers. Oh the joy in my heart the first day of term brings – not just because I can leave the teachers to deal with my little darlings still on a sugar high and spoilt from the Christmas excesses (hurrah!) – but they look like the family I always imagined I’d have. Clean, bright, with pony tails bobbing (hair bands matching) and not one shout of ‘what do you mean you’ve got PE today?’ as, with time to spare, we walk calmly and smugly out of the house. However that was then, this is now. Week 2 and snow is forecast. After a mad 5 minute scrabble in the hats and scarfs box things are not looking good. The box is located by the front door for the little darlings to easily deposit their accessories as they arrive home. It is currently proving as useful as the shoe crate by the hall table and the shin pad container on the coat rack – NOT VERY. Any of these this-will-absolutely-revolutionise-my-life purchases might have had some worth if a) the children used them and b) they brought back said accessories/shoes/shin pads in the first place – at this stage I might have pointed out these facts out to the children, just a couple of times. 4 single gloves are found. I decide to send my 5 year old to school with the only matching pair. Reckon he will have best chance of fitting into something where the label reads age 18 – 24mnths. Struggle with the ridiculous things for a further 5 mins – the lining has come away from the glove making it nigh on impossible to get fingers in the right place. 5 year olds’ fingers are now making the vulcan salute. I suggest that his teaching assistant is very good at putting gloves on. The two older kids are to take one glove each and although not matching are, by some minor miracle, a left and right hand. With instructions to rendezvous in the playground at playtime and work out who needs the pair most I reckon we are ready to walk out the door. The 10 year old kicks off. He believes that he should get both gloves due to the fact he is wearing his sister’s sweatshirt. Sure enough my lanky 10 year old has the bottom third of his arms, naked, hanging out of a red jumper. I suggest that if he hadn’t lost 2 and smeared papier mache gloop over the other of his sweatshirts he would not be in this predicament. I bundle them out of the door thinking roll on the summer – or maybe not – sun hats, sun glassess, sun screen – arrrgggghhh! After the success of our Stamptastic twitter competition last week, Stamptastic have very kindly given us another of their fantastic stamp sets to give away – look out on facebook next week for details of how to enter.